Ninebark, a native shrub with an intriguing name, is a plant worth getting to know. Its many attributes include an abundant flowering habit which is currently being exhibited in Virginia. 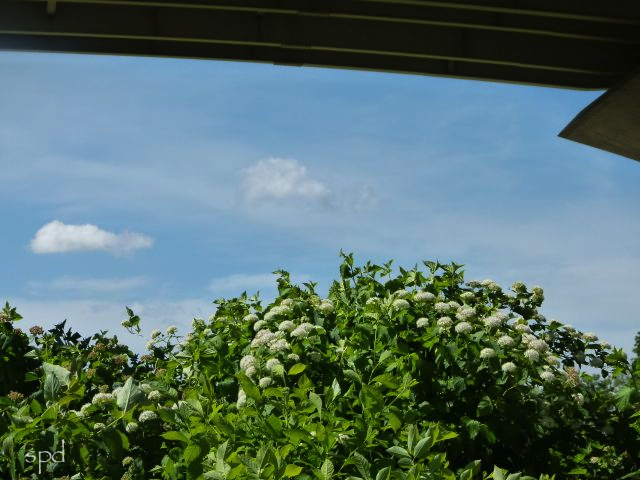 The city of Alexandria put some native plantings in new park at the base of the Woodrow Wilson Bridge three springs ago. Last week a veritable explosion of vibrant new blooms was on exhibit for all the visitors to enjoy. The Flora of Virginia lists the habitat of ninebark as, “ Dry rocky open woodlands, barrens, cliffs, outcrops, rocky river shores and bars, riverside prairies, stream banks, fens, and seepage swamps.” This explains why Donald Leopold lists ninebark with the shrubs that are ranked ‘tough’ in his Native Plants of the Northeast. 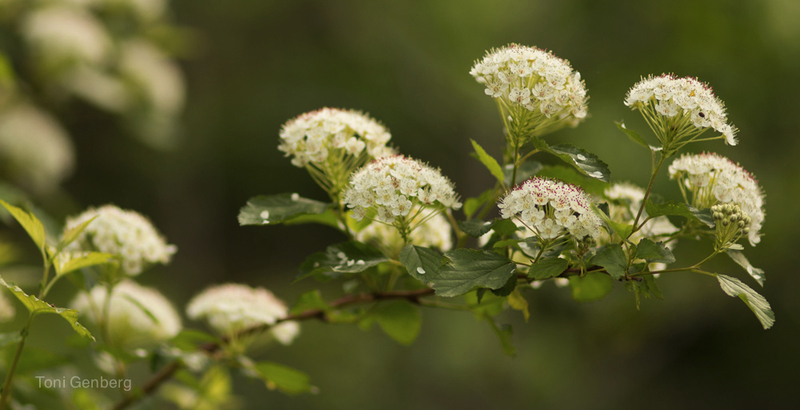 The Flora describes ninebark as “Frequent to common in the mountains; infrequent to locally common in the Piedmont; rare in the Coastal Plain.” That’s quite a range, and generally speaking, plants that are that widely adapted are among the most forgiving for growing in conservation landscaping at home. Ninebark, a member of the Rosaceae family, is multi-stemmed, with densely arched, re-curved branches, reaching heights between 5 to 12 feet, with a spread from 6 to 12 feet in the Mid-Atlantic area. Birds like to use the dense cover for nesting sites. This shrub is variously referred to as ‘atlantic, eastern, and common’ ninebark. The leaves of ninebark show a lot of variation in size and shape even within one bush. Leaves on the smaller branches show the most shape variation. Leaves on the most vigorous stems are larger and more uniform. The Flora describes them as ovate to ob-ovate or somewhat cordate, with three principle veins. Here’s a link to nice illustration of these if you want a reminder: Leaf Shapes. The flowers bloom at a time when the first rush of spring ephemerals is over, but summer’s bounty has not yet begun, a welcome addition at that time. The flowers are formed in dense corymbs on the new season’s growth, and literally smother the shrub’s surface with snowy white puffs. And of course, the distinctive bark. Over time the bark exfoliates loosely, or shreds, in narrow strips. Each layer is a slightly different color due to age and exposure to the air. This feature gives the plant a touch of winter interest. Once the flowering stage is passed, a fruit begins to form immediately, dark glossy red. This inflated capsule is where the scientific name comes from: Physocarpus opulifolius – physa, a bladder and karpon, a fruit. In short order the segments begin to fade in color, and the whole structure, which faced upward when it was in blossom, now flops over and dangles downward. 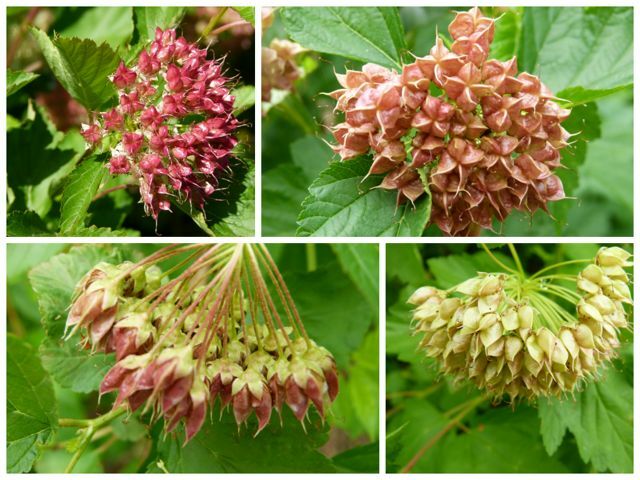 Thus the color progression has moved from the pink/white of the opening flower buds through dark red, dull red, to a rosy tan. It provides further visual interest by clinging on into winter until and unless eaten by birds. Interesting and quick transition after the white blossoms fade. 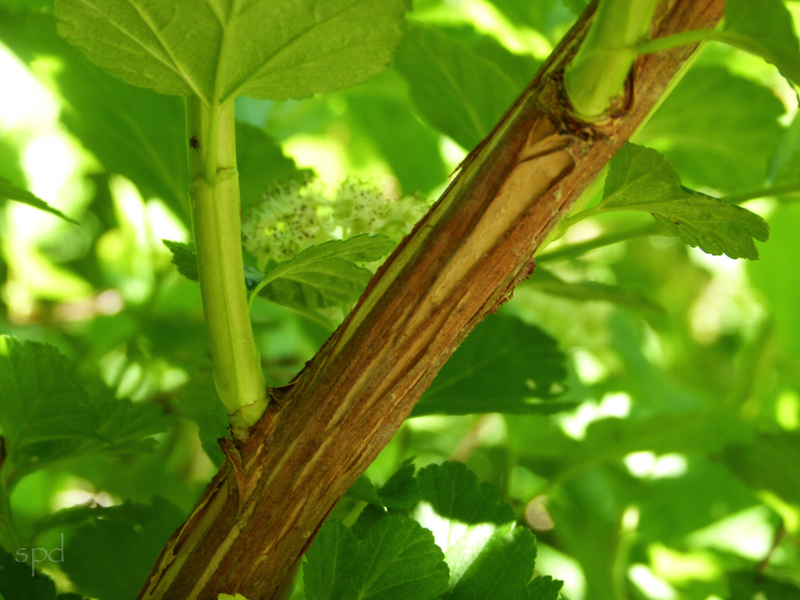 In a home landscape ninebark can be pruned after flowering, or older canes can be removed right down to the ground to control height. Ninebark is a long-lived shrub requiring little care once established. Especially good for stabilizing slopes. This hardy shrub would certainly make a good ALTER NATIVE for Japanese Spirea. Ninebark is also a valuable nectar source for many pollinators, including native bees. It’s easy to propagate from soft cuttings, and seed needs no pre-treatment. Just another outstanding Virginia native plant! Thinking of planting this near a deck. For a bit of privacy. How far from the deck so I don’t have to keep whacking it back? Do you know about whether the deer like to browse on Ninebark”? 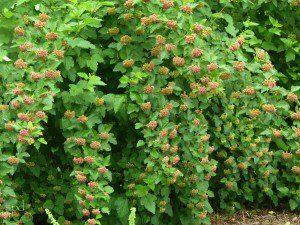 Can I plant Ninebark in zone 1? It is listed as a Rhode Island native and plan on planting it in a CRMC area which is OK’d. Just curious about their salt and wind tolerance. Will be roughly 50 feet from the waters/oceans edge with some Rosa Rugosa as a slight buffer.